The book, primarily written keeping in mind fresher as well as experienced implant dentists, provides all the new and relevant information of basic to advanced implantology for the undergraduate as well as postgraduate dental students. 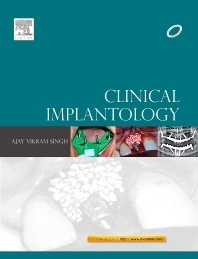 Current concepts of implantology are beautifully presented with illustrations and clinical cases making this book a complete literature for the dentists to learn the basic science and various advanced techniques of implantology like sinus grafting, nasal floor grafting, block grafting, ridge splitting, distraction osteogenesis, soft tissue grafting, ‘all-on-4’/‘all-on-6’ techniques and many more. Ajay Vikram Singh graduated in 2003 from Saraswati Dental College, Lucknow and received Implantology certificate from India. He received advanced level implant training at various centres and continuing education implant programmes in USA. He also received continuing education in implantology at the School of Dentistry, The University of Queensland in Australia. Currently he is an internationally acclaimed mentor, speaker and researcher in the field of implantology. He has spoken as the key note speaker in the various national and international implant conferences in India and abroad. Besides being the active member of various prestigious implant associations, he is the fellow and diplomat of International Congress of Implantology (ICOI). He is the founder President of International Academy of Implant Dentistry (IAID). He has written several articles on implantology in national and international journals. He is the founder of International Implant Training Centre (IITC), Agra (India) where he trains dentists from India and abroad in basic and advanced implantology.